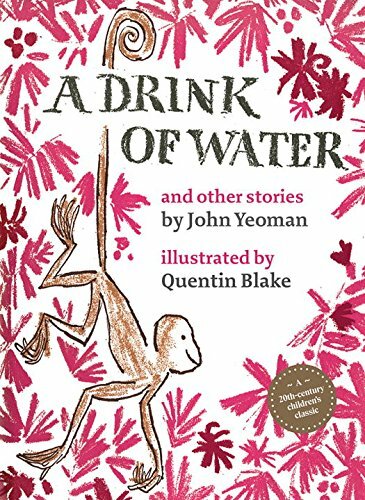 A Drink of Water (and Other Stories) is a reprint of the original 1960’s classic, Blake’s debut as an illustrator. He subsequently illustrated over 300 children’s books, with dozens of titles in collaboration with Yeoman. The duo continues to produce picture books such as The Young Performing Horse (2016), The Fabulous Foskett Family Circus (2015), and Up with Birds! (2013). Fans of Blake’s style will appreciate seeing where it all began. While his current artwork is slightly more refined and angular, the illustrations here are rougher and sketchier. Still, they carry Blake’s voice and are fun and distinctive. The only complaint is that there aren’t nearly enough illustrations from story to story. On the one hand one might argue that for this age group (7–10 year olds) having one (or, at times, two) small vignettes per story is appropriate because it encourages kids to imagine on their own. This is not necessarily a picture book. On the other hand, a few stories are so visually descriptive, with references kids might not relate to (The Discontented Jackdaw), that more pictures would be welcomed additions. Plus, there is no such thing as too much Blake artwork. There are seven short stories in the collection. Each just a few pages in length but providing enough space for Yeoman to create worlds with a quirky problem, likable anthropomorphic characters, and a sturdy punchline finish. There is just the right amount of substance for young readers to tackle on their own in one sitting. Using only animal characters (with one exception) immediately draws sympathy. From a clever young monkey in the title story to the old-timer dog and impish bear, to a ewe, a goat, a kitten, a sloth and a variety of birds, stories move from sultry jungle, to impoverished field, dense dark forest, farm and marshland settings. No matter where they are, the reader is privy to the thoughts and motivations of each character that seems to mimic the thoughts and motivations of humanity. This way the stories are able to tackle moral concepts or point out idiosyncrasies in human conduct without seeming chastising or preachy. Particularly convicting is The Heron and the Crane in which miscommunication destroys an opportunity for meaningful friendship. Each time the heron and the crane approach one another there is an unintended offense, a prideful paranoia, or a misinterpreted stubbornness of character, which is, eventually, irreconcilable. The reader will readily identify with the pitiful conclusion and perhaps translate it into modern day relationship turmoils made complicated by technology pitfalls such as tweeting and texting. It is remarkable how applicable and relevant these stories still are given the vastly different societal and technological constructs of the 1960s when they were first written. In this way, A Drink of Water is destined to join the ranks of equally memorable fables attributed Aesop, T. S. Eliot, E. E. Cummings, Huxley, or Tolstoy.